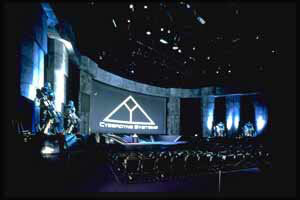 After the pre-show, people are guided to the Cyberdyne Presentation Center for a classified preview of one of Cyberdyne's latest technologies. Kimberly presents the show and shows the audience the new T-70 Autonomous Infantry Units, until they are interrupted by Sarah and John Connor. USF: "Ladies and Gentlemen... here at Cyberdyne Systems, armed combat has entered the age of robotics." USH: "Ladies and Gentlemen... armed combat has entered the digital age."